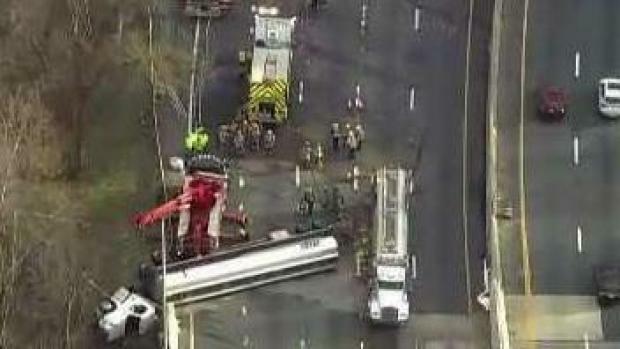 Friday morning commuters can breathe a sigh of relief: About 12 hours after a tanker overturned on the Beltway, Inner Loop lanes reopened. Traffic started to flow through about 2:30 a.m. Friday, after a multijurisdictional crew cleared a tanker that overturned near the American Legion Bridge and spilled fuel onto the road. The tanker was carrying about 8,500 gallons of fuel, making it impossible for crews to simply tow the truck off the Beltway, Fairfax County Fire and Rescue said. About 150 gallons of fuel spilled across the road. Firefighters pumped fuel out of the vehicle and then moved it off the road. Traffic cameras show traffic moving normally for the Friday morning commute. 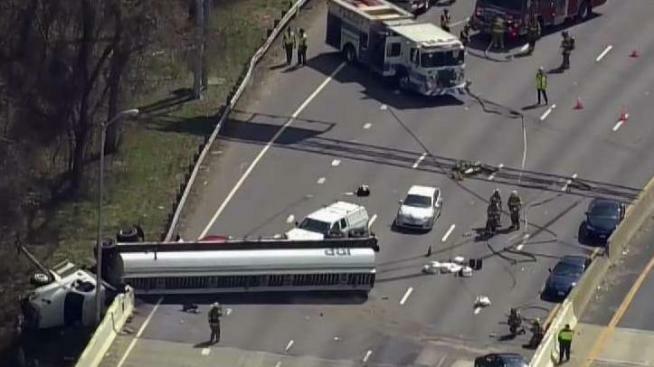 Three cars were involved in the crash with the tanker about 1:50 p.m. Thursday, Fairfax County Fire and Rescue said. One person was taken to the hospital with minor injuries. Inner Loop traffic immediately came to a halt and rubbernecking slowed traffic on the Outer Loop. Major roads near the bridge faced stand-still traffic as crippling delays rippled throughout the city. By 11 p.m., major delays continued to prevent drivers from getting to their destinations. "I've seen people get out of their car and walk," said Sandy Rosenblatt, who was stuck in the traffic. "I pack my lunch every day and packed extra snacks. I had two extra bananas and that was my dinner."